The owners of independent optometrist and eyewear specialist, Insight Eyecare were determined to create an ‘out of the box’ experience at their Te Awa Mall concept store. The client wanted to break away from the traditional experience customers have when visiting a clinical optometrist. The design of their store needed to tempt customers into the space and put them at ease once they had arrived. With a strong focus on product sales, and a number of exclusive product ranges, they also wanted to create a retail offering that was too good to ignore. Working with Ignite’s specialist retail team, Insight Eyecare was able to turn the pre-conceived idea of an optometrist’s store on its head. The design created a unique concept that entices customers and promotes sales, despite the highly competitive retail environment. Critical design considerations for the project included the need for a private space to try on glasses, something that most other competitors lack, and the desire for a social hub where customers could interact with staff in a comfortable and relaxed setting. Warmth, privacy and an industrial edge are not common descriptions for an eyewear store, but they were precisely what the client’s brief required. To deliver on the brief, the design includes oversized double entry doors, which welcome customers into the store and remove any reason to hesitate. Black window display boxes are individually lit with spotlights, and featured eyewear is displayed in white acrylic cases that glow with light and make the product ‘pop’. Within the store, the extensive use of blonde timber, married with grey tones, creates a feeling of warmth, while bronze hardware blends the traditional with the industrial. 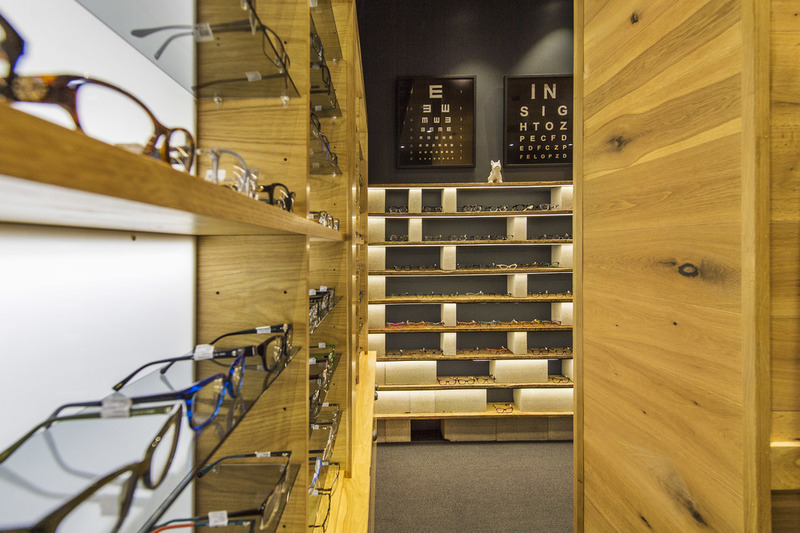 The use of cinder blocks and reclaimed timber on display shelves adds to the industrial, edgy feel and sets the space apart from a conventional optometrist’s store. Careful consideration was given to traffic flow, with Ignite’s design team ensuring the store worked on a number of levels. Customers are put at ease as they browse and can retreat to private spaces to try on eyewear. Customers wanting a consultation can interact with staff around a central leaner, which also acts as a comfortable waiting area for shoppers’ companions. The warm, blonde tone of the timber fit-out creates a textural softness aimed at enticing customers into the store. Of particular note is the oiled oak shopfront joinery and bulkhead, which gives off a natural fragrance. Whether they are aware of it or not, customers are put at ease by the pleasant natural aroma of the timber.